Voice Search in 1,000 Words (or less) | Jody Nimetz Co. I have been doing Search marketing and digital marketing for about fifteen years. One of the things that I have been anticipating is voice search. Although the digital age has given us access to the World’s information whenever we want it, the digital age has made people a bit lazy. Think about the shift to mobile from desktop. Part of the difference with this shift is with regards to convenience or the ability to find information quickly from anyplace at anytime. For 2017 the number of mobile phone users is forecast to reach 4.77 billion. The Earth’s population is currently around 7.4 billion. By 2019 it is estimated that 67% of the Earth’s population will have a mobile phone. (Source: Statista) So it stands to reason that voice search is only going to become more popular. 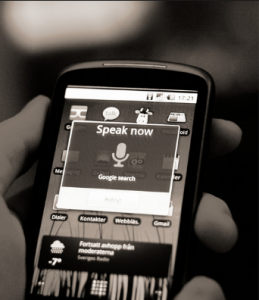 Voice search is the ability to simply use a device to find information by speaking into the device. Voice Assistant is technology or AI that a user can speak into and be provided with a response. Examples of voice assistants include: Siri, Google Home, Amazon Echo/Alexa, Microsoft’s Cortana or OK Google. Results are immediate – when you use voice search the results are immediate. Providing that your query is not too general and that you speak clearly you should receive instant results based on your query. No scrolling required. Voice search is fast and you can do everything nearly instantaneously. Voice search means less typing and less typing means less auto correct – ever text something or type a search query into Google and have a typo? The experience can be frustrating sometimes. Voice search eliminates the auto correct or at least makes it a a little less cumbersome. More Accurate Results – voice search is still in its infancy, but voice search can provide you a very straightforward answer to the things you ask. It’s all about natural language – for years search was strictly keyword based. Can you image speaking what traditionally was a robotic-typed queries into Google. In the “old days” you may have types in “toy stores” into Google… you might get some relevant results you might now. With voice search you can use natural language to ask more in-depth queries such as “what are the nearest toy stores to me?” and chances are you will have a better experience. Voice search is meant for quick answers. If you are doing in-depth research you are probably going to use more traditional search and study habits but for quick facts (i.e. when do the Oilers play next?) you can gather information in a hurry. Searchers have become more savvy. The lengths of queries have gotten longer. It is no secret that Google has updated their algorithms to focus on the natural language and semantic search activity. (Hummingbird anyone?) I feel that one of the items that will have the most dramatic impact on Search is voice search. Do voice commands work perfectly every time? No but they will get better? Does Google’s RankBrain provide better results every time, no but we do expect it to get better as machine learning technology improves. Last month Google communicated that 20% of their mobile searches were voice searches, and I expect this trend to continue. In fact data from a MindMeld survey suggested that 60% of respondents had started using a virtual assistance or voice search in the past year. Voice search is growing dramatically. MindMeld states that in 2014, voice assistant usage was negligible. Today, voice usage exceeds 15% of all search traffic. This is changing how brands are interacting with their customers. Expect even more voice assistant to enter the market as we see an increasing trend in voice assisted and AI activity. We are already seeing transactional services being intergrated into voice assisted AI. Google Home for example now includes services for Uber, Pandora, Spotify, WhatsApp and Ticketmaster. From a digital marketing perspective, for years now we have been seeing an increase in in longer-tail searches and question-based search phrases. Expect to see a lot more of these types of queries as people gravitate to using voice assisted search more often. In a future post I will discuss how you can adapt your content strategies for voice search and mobile activity. The future is voice-activated search driven by artificial intelligence, natural language processing and machine learning. Your content marketing strategy needs to consider the increase in voice-activated searches. You need to prepare content that can be understood by machines and not just human visitors. Pingback: 21 Stats About Voice Search that you Never Knew | Jody Nimetz Co.